Models for planning and executing organizational change abound—for example, Kotter’s eight steps, among many others. These models are helpful in highlighting many of the critical aspects of organizational change, and I highly recommend immersing yourself in them. That being said, I find that such models often deal more with planned organizational change than with unplanned or continuous organizational change. And in an increasingly turbulent world, it’s important for human resources (HR) professionals and the HR function overall to take a more fluid, proactive and strategic approach toward change. The realities of the business environment continue to drive changes within organizations, and it’s time for HR to get up to speed. From what I’ve observed and experienced in HR during the past decade, the HR profession has an opportunity to contribute meaningfully to how organizations adapt. But we in HR may need to consider organizational change from a slightly different angle. We must start with connecting with the organization’s strategy, and we can then use that direction to guide what we do. Furthermore, we’d be well served to think about what we do a little bit differently, adopting some of what’s working well elsewhere, to get things done quickly. It’s critical for HR professionals to understand their environment, or their terrain, both within and outside of their organization. While it’s important to know what people in HR care about, it’s even more important for HR people to know what their top leaders outside of HR care about—what are the main concerns of the c-suite? We in HR also must start thinking much more than we do currently about the environment outside of the organization—where does your organization compete? How does it win? What are the big trends in your industry, and how can HR address them? 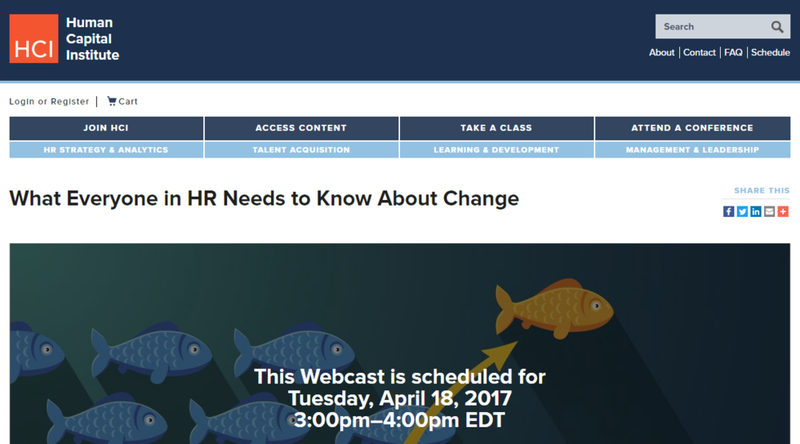 These questions and others like them allow HR professionals to better understand what’s ahead and anticipate change. 2. Think like a startup. The ambiguity of working in a startup is extreme. Everyone has advice; most of it seems plausible, yet some of it is contradictory. Yet you must forge ahead and create that which has never existed. Given the nature of startups, it’s worth thinking about how they deal with ambiguity and change to see what lessons we may glean for HR. I advocate for a more strategic, proactive, entrepreneurial and agile HR function that will quickly add value to the business. In addition, startups can deal with change in a more iterative fashion, taking some of the lessons we know from design thinking to develop fast prototypes, test them and continually improve—instead of letting the perfect become the enemy of the good. As organizations attempt to cope with a turbulent business environment, they may need to move from continually seeking equilibrium to being nimble. Agility, generally speaking, is the capability to sense and respond quickly to the forces of change at all levels within the organization. HR would be well served to assess its own agility, along with the agile capabilities of the organization overall. But agility isn’t about reckless flexibility. Rather, we all need some “North Star” to cling onto as our organizations adapt and evolve. As such, HR can help provide stability through working with top management to clarify and communicate continually its core values. Additionally, “agile HR” involves moving from some of our tried and true dogma (e.g., job descriptions) to practices that reflect how people actually work (e.g., project and team charters). I see the next 10 years as ones in which HR will likely go through a number of dramatic shifts—because if it doesn’t, it may become a victim of accelerated obsolescence. And when it comes to remaining relevant through a different understanding of change, having an increased focus on (a) knowing the terrain, (b) thinking like a startup and (c) embracing agility will serve the HR function and those who work within it well. I’ll be discussing these topics in much more detail next Tuesday, April 18, from 3 to 4 p.m. EDT in a webcast with the Human Capital Institute. Click here for more details. I’d love to have you join the conversation. UPDATE: The webcast was great--hundreds of people joined me for a wonderful conversation. Click here to access the full recording and the slides I used.